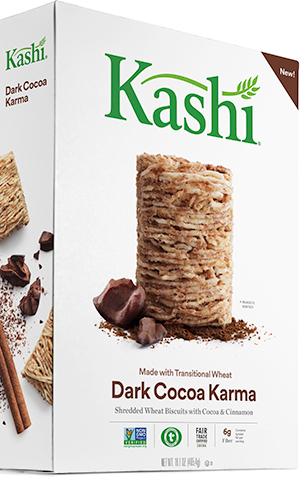 Kashi is helping to grow organic crop supply by sourcing Certified Transitional ingredients for products like its Dark Cocoa Karma Shredded Wheat Biscuits cereal, which launched last summer. Producers who make the 36-month transition from conventional to organic crops are financially burdened as they invest in organic farming practices but are unable to benefit from organic prices for their crops. Grain producers are particularly challenged since wheat tends to be a lower-cost commodity than fruits or vegetables, and soft wheat is susceptible to disease, which is harder to combat while making the organic transition, noted Nestojko. “Current commodity prices for conventional grains are so low that you can’t cash flow the added expense of the organic production requirements through the transition years,” Nate Lewis, farm policy director of the Organic Trade Association, told SN. 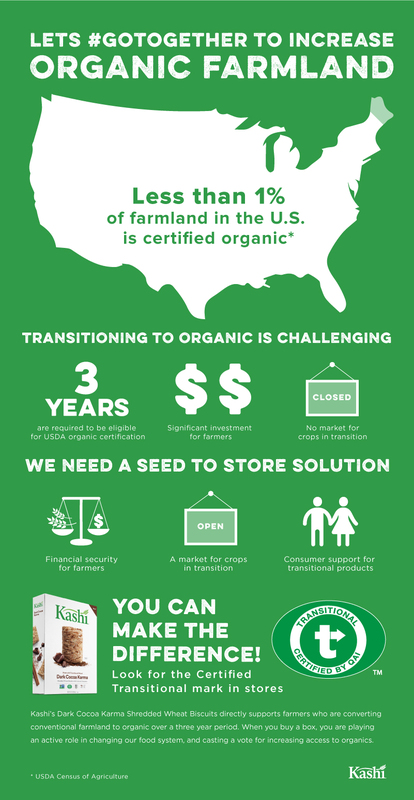 To help create a market for transitional crops, Kashi engaged QAI, a USDA-accredited organic certifying body, to lead the development of the first transitional certification requirements, which are now open to all. Kashi’s Dark Cocoa Karma features QAI’s green Certified Transitional seal, which guarantees that a product contains a minimum percentage of transitional ingredients. Kashi worked with its supplier, HESCO/Dakota Organic Products, to identify farmers in Nebraska and Wyoming who could supply Certified Transitional grain for its Dark Cocoa Karma Shredded Wheat Biscuits. Once a farmer secures a contract for certified transitional crops, it’s easier for them to get insurance and loans to invest in the process, explained Nestojko. Once Russell’s transitional crops become organic certified, Kashi will secure additional transitional crops for its cereal. “As this farmland completes its transition to Certified Organic, new farmland will be used to provide transitional wheat for future batches of Dark Cocoa Karma, which will remain a Certified Transitional product for as long as it is part of the Kashi portfolio,” Nestojko explained. Dark Cocoa Karma has been well received by consumers, according to Nestojko, who reports that it’s the company’s best-performing cereal innovation in over five years. The brand will launch a new Certified Transitional campaign next month, and plans to add additional Certified Transitional products to its lineup. Products that source “organics in training” will likely gain momentum thanks to a new partnership between the OTA and USDA that will create a National Certified Transition Program. The first round of approvals for certifying agent accreditations are expected to be complete on March 17, according to the OTA’s Lewis. Producers who are 12 months into the 36-month transition process will be eligible for certification. “If it’s a 30-day crop they may [gain certification] later this spring, but if it’s corn or soybean it likely won’t be until they’re harvested in October/November,” Lewis explained. A taskforce of OTA members determined that under the new program, “each individual certifier should have the ability to develop their own specific seal for transitional products, with the limitation that it not appear on the principal display panel, so it would be part of the information panel on the side,” said Lewis. It’s unclear how significant the retail price premium on such products will be, said Lewis, who noted that it all depends on how the manufacturer plans to recoup the premium that it’s paid for supply. “Are they going to pass it on to the consumer with a label of a transitional product or are they going to see it as an investment in securing future organic supply?” he asked. Marketers who are focused on the former will face unique challenges in conveying to consumers — who may still be puzzled by certified organic products — what transitional certified means. “It could be confusing to a consumer since ‘transitional’ is not something that rings with an intuitive sense,” said Jim Wisner, president of the Wisner Marketing Group. To help raise awareness, Kashi created a YouTube video and sought support from prominent consumer influencer Robyn O’Brien, as well as the chairman and executive editor of GreenBiz, Joel Makower and the OTA. “We also reached out to our peers within the food industry to encourage them to join in on the effort,” said Nestojko. “We know we can make a bigger impact by working together.